Metabolic equivalent: Which physical activities burn more energy? 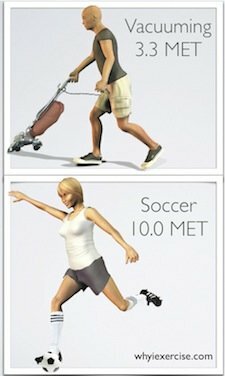 Pick the best exercises by fitness level and calories burned. 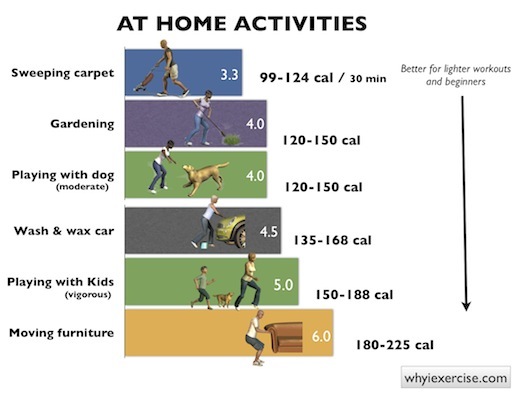 Metabolic Equivalent (MET)* shows you the amount of energy you burn during exercise and various physical activities, such as housecleaning. Use this information to find out how many calories you burn with exercise in an average day. Then adjust your daily activities. You can make it easier to lose weight! 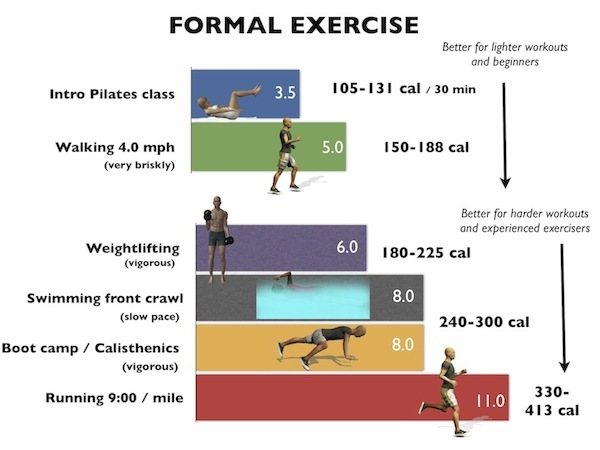 In this article are calorie charts for sports & hobbies, home activities (vacuuming, yard work) and formal exercise (swimming, walking on a treadmill). The charts compare the calories burned during 30 minutes of each activity. *1 MET Equal to the energy burned at rest, which is 30-38 calories for every 30 minutes. Calories are calculated for the average adult in the US, weighing 165-190 lbs. Your exact calories burned during exercise may vary due to differences in muscle mass or how vigorously you work during the activity. Still missing the metabolic equivalent for your activity? Find the most complete list here. Think of the calories burned on the Metabolic Equivalent charts as an average. Raking the lawn can be done at a slow pace, which burns less energy, or it can be done more vigorously which burns more calories. In the same way, a light game of 2-on-2 basketball is a lighter workout than a highly competitive game of 5-on-5. Need more guidance in picking activities? Take the Rockport walking test. 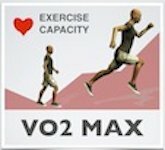 Once you have your fitness rating (VO2 Max), you can pick the activities that best match your fitness level. Click the chart below to take the test. As you become more fit, you'll be able to add higher calorie- burning activities to your routine. With this in mind, during whichever type of exercise or physical activity you choose for your workout, pace yourself according to your ability level. If you are a beginner, or if you need a lighter workout today, keep your effort moderate. If you are a (well-rested) fit person looking for a harder workout then you can work at a high intensity. 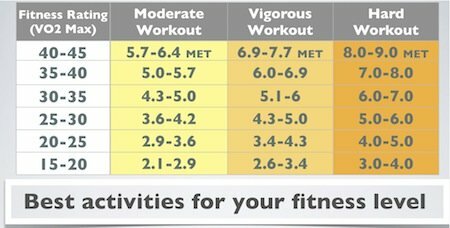 The exercise effort scale will help you maintain the best level of effort for your next workout. Using metabolic equivalent allows you to include all kinds of activities in your workout plans. Sports, playing with children, yard work and dancing can all be part of your plans to get in shape. All you need to do is keep moving and maintain a moderate effort during the exercise. 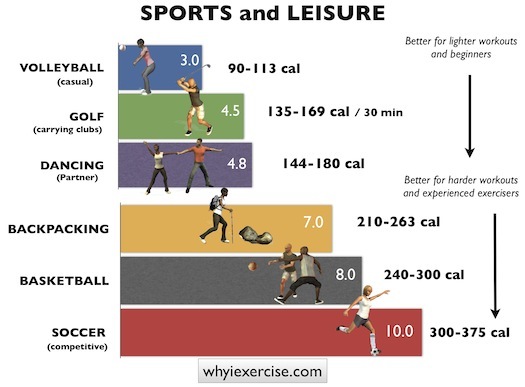 Compare the calories burned in 30 different exercises and physical activities. Calories are calculated for male vs. female and for 3 separate weight classes. 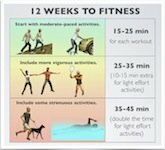 Follow this 12 week plan, using your favorite physical activities, to guide yourself to the amount of weekly exercise your body needs for good health. Walk 1 mile for time, and enter your heart rate into the fitness calculator. The better your fitness score, the lower your risk for future health issues. Find out how much you need to improve your cardiovascular endurance to lower your risk of future health problems. Return from metabolic equivalent to free home exercise programs.